Fitbits are the perfect technology for your wrist, keeping you in touch with the rest of the world while you’re going about your day. Most keep track of your exercise and can even show you your messages while your phone is tucked somewhere safe and secure. But how much can Fitbits help you in the water? Which Fitbit is waterproof? We have answered these questions for you below. Waterproof Fitbits are great investments for anyone who’s out on the water; having a way to keep track of the real world while you’re enjoying yourself is pretty important. As the leading brand in wearable technology, Fitbit has worked to create many different Fitbits that work for every lifestyle. However, there’s one Fitbit that stands out among the rest for its capabilities both on and off the shore. The Fitbit Versa is the ideal mix between a smartwatch and a fitness watch. 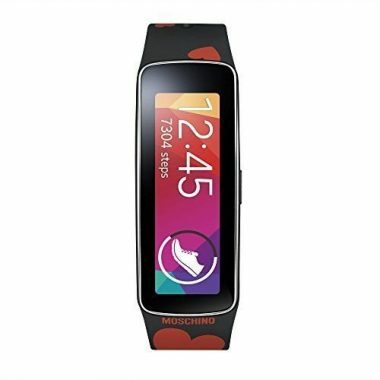 Featuring a fully colored screen that shows you both your notifications and workout videos! It can store up to 300 songs and lets you customize the clock in more ways than ever before. 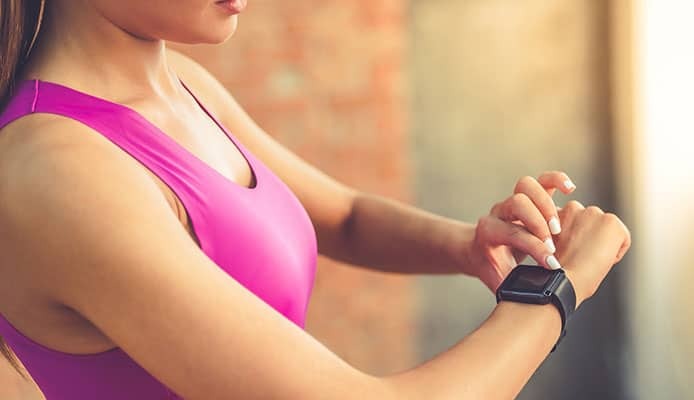 You can even connect your bank to be able to pay from just your Fitbit swimming watch, and there are hundreds of apps that can be downloaded to help you go through your life. 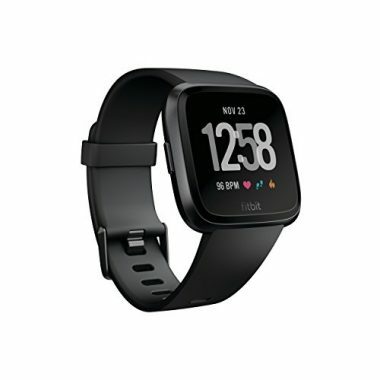 Similar to the Fitbit Versa, the Ionic is one of Fitbit’s higher end smartwatches. The Ionic is a waterproof fitbit for swimming and exercise, making sure that the PurePulse heart rate tracker to most accurately see the results from your workout. The Ionic also comes with a sports band that is as waterproof as the watch! 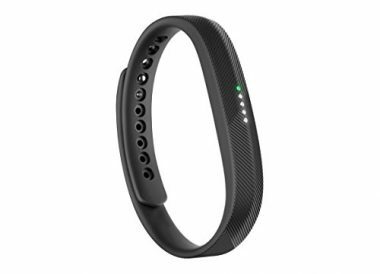 If you’re looking for a small, discrete, waterproof swimming Fitbit, then the Fitbit Flex 2 is the perfect fit for you. Instead of featuring s screen, the Flex 2 shows different LED lights for whatever notifications you have. The slim design paired with 12 different colors gives you the most versatile options at the best price. As the first Fitbit to record your heart rate, the Fitbit Charge HR is most notable for its ability to do just that. It also features the most broad color range with colors ranging from bright teal to a plum purple to the perfect black. The Fitbit Charge HR is similar to the Surge, but just without a few features and a lower price point. The Fitbit Surge is the perfect accessory for those looking for a sleek exercise tracker that matches every occasion. There’s multiple different colors to choose from, including a cool black that’s perfect for every situation and a zany orange that’s the perfect shade for every fun-loving person. The best fitbit for swimming has a lot to do with your own living habits and what you want out of your smartwatch. You want your Fitbit to best match your lifestyle, whether that’s kayaking and getting it splashed or snorkeling through coral. All of these are different things you can think about when going to choose what Fitbit is best suited for you, so make sure that you know what’s important to you. While a perfect heart rate tracker like the PurePulse may be essential to some people, it might make no difference to you. Think about your health and lifestyle to make these decisions. 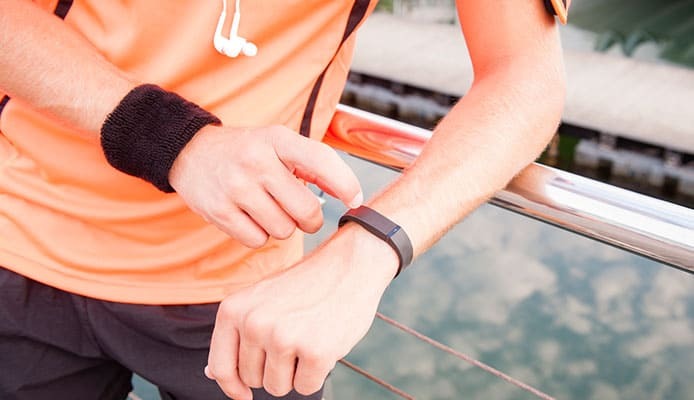 This guide is all about waterproof Fitbits, so what’s the most waterproof of all the Fitbits? Most people just assume that all Fitbits are waterproof because of the type of material they make their bands out of. If that’s the case, then how can you tell if a Fitbit is actually waterproof? Well, the Ionic and the Flex 2 are both completely waterproof, meaning that you can take them in the water and not have to worry in any way. These two are made to survive swimming trips and can provide tracking for swimming exercises, such as lap times or water aerobics if you set them to. These Fitbits are perfect if you’re someone who likes to swim a lot, or even if you enjoy being in water that’s any kind of rough. While the other Fitbits are splash proof, you can easily get really wet in many different water activities without ever actually getting in the water. However, the Surge, Charge HR, and Versa aren’t meant for swimming excursions, but they are safe against the occasional splashing. Each of these are great for any time you spend out on the water, and they’re pretty protected against any causal mishaps. The next big question when it comes to waterproof Fitbits is which has the best battery life. The battery life of a Fitbit is pretty long compared to other smartwatches in general, but the Surge takes the fame with its 7 day battery. The Charge HR and the Flex 2 both last 5 days, while the Versa and Ionic last 4 days. If you’re looking to go on camping and adventure excursions, a longer battery life can keep your Fitbit working for as long as you need it; an entire week without a charge lasts longer than most phones do, even with minimal use. The Surge will definitely be along with you for longer than any other smartwatch can, and even the other Fitbits will last as long as our phone will. Another good thing to think about when looking for the best waterproof fitbit for swimmers is the band size and what kind of band you want. The waterproof Fitbits offer a variety of band sizes so that you can get exactly what you want! The Flex 2 is by far the smallest of the waterproof Fitbits as it was initially designed to be thin and out of the way. It foregoes a screen and instead uses LED dots to show you any notifications or alerts, giving you the smallest exercise tracker possible. The Surge and Charge HR make up the medium size splash-proof Fitbits, but each of them feature a screen for you to see more detailed notifications. While they’re larger than the Flex 2, they both are made to be as sleek as possible so that they don’t interfere with your exercising or daily life. The Versa and Ionic are the biggest of the waterproof Fitbits as they each have a much bigger screen that can show a lot more, including workout videos. Because of this, these smartwatches might get in the way more than the others, but the Ionic in particular is made sleek enough so that it shouldn’t cause any issues in your workout. Another important issue to think about when deciding the best waterproof Fitbit is how well it syncs to your phone. This can come in handy if you think about how far away your phone will be from your person as well. Both the Charge HR and the Ionic claim to stay synced to your phone within 20 meters. The other waterproof Fitbits don’t make any comments on how far the connection is stable for, leading to the idea that it’s probably less than 20 meters. If you plan on keeping your phone stored away from your person, it might be a good idea to take sync distance into consideration; you don’t want your Fitbit to disconnect from your phone while you’re on the water. The heartbeat sensor in your waterproof Fitbit is another major perk; while many smartwatches have heart rate sensors, not very many can come close to the quality of Fitbits PurePulse. All of Fitbits waterproof smartwatches have the PurePulse heart rate tracker in them with the exception of the Flex 2. The Flex 2 sacrifices this perk for its sleek design. While the Flex 2 doesn’t have the PurePulse tracking system, it does include a heart tracker in it, so users won’t have to completely sacrifice their heart tracking software. If you’re someone who has heart issues or need to watch their heart rate, the PurePulse feature is pretty important. You’ll have your waterproof Fitbit while you’re exercising, a key time for watching your pulse. This is one of the Fitbit perks that could affect your health, so make sure to put a lot of thought into this decision. Another thing to take into consideration is the reviews of whichever Fitbit you’re going to buy. While customer reviews can be a bit skewed (not all customers do research before buying, and some customers don’t pay attention to the details of what Fitbit they’re buying before they purchase one), it’s still important to scan through them to make sure there’s nothing off-putting. The Ionic and Versa are both stable products that don’t have very many complaints. Both of these offer many additional things compared to the other waterproof Fitbits, so it makes sense that people don’t complain about those as often. There doesn’t seem to be any common issues that customers complained about either. The Charge HR has a few more problems than most of the other waterproof Fitbits. Most people say that they love their device, but after everyday use a bubbling issue occurs on the band, making the device unwearable. Several customers have commented that they have bought multiple ones because they loved their Charge HR, but the band is a big cause for concern. The Surge also has a few common issues that stop people from using their waterproof smartwatch. The bubbling effect is an issue with the Surges as well, but people don’t seem to love their Surge devices as much as they love their Charge HRs, so the issue is more prevalent. Many people have also complained that, despite having the PurePulse heart tracking system, the Surge’s heart tracker stops working as well after a few months. Q: Why Do I Need A Fitbit? A: Fitbits are one of the most iconic exercise-tracking smartwatches. Their popularity is in large part due to the rise of technology;smartphoness are becoming more and more inseparable, but there are situations where your phone isn’t necessarily appropriate being out, like in meetings or movies. Think about what pagers did. People were able to be notified if they were needed easily, and this simple invention was made before the popularity of cell phones. Now, people can have pager-like items on their wrist with a variety of other features, including the ability to respond back. If you’re someone who exercises frequently or does any other activity that doesn’t let you spend much time beside your phone, then a Fitbit is the perfect way for you to go about your day without being worried that you’re missing an emergency call from anyone. Besides the convenience of a Fitbit, they’re also extremely handy for exercise. They’re one of the best exercise tracking smartwatches on the market, and they’re known for it too. With a variety of levels for every kind of person, Fitbits are the best option for anyone looking for the best waterproof fitness tracker. Depending on the exercise you do, it might not be safe for your phone to be with you. For example, if you’re kayaking and you have a smartwatch, you can store your phone in a dry bag while being available should any emergencies happen. Your Fitbit will notify you of any notifications regardless of the kind you get, so you can enjoy nature without having to be worried that something is going wrong on the shore. Q: What Is A Fitbit? A: Fitbits are the best exercise smartwatches on the market and for good reasons too. The company has been creating fitness accessories that can be worn since 2007, so they know what they’re doing. Not only that, but each of the waterproof Fitbits discussed above have the features of most other smartwatches, and most of them surpass the typical smartwatches nowadays. Fitbits track your exercise in a variety of ways and provide the best experience to every kind of person. No matter what level you’re at physically, your water-resistant Fitbit will be there with you every step of the way. For the casual people, Fitbits have a step counter that lets you decide how many steps you want to take per day and helping you achieve that goal. This is an excellent starting point for most people who don’t exercise regularly; while getting up and moving doesn’t sound like it does much, your body is improved drastically by these little goals. If you’re a bit more serious about your exercise, Fitbits provide you with tons of information about your daily life that can help you improve how you exercise, including workout plans and videos through the app that connects to your phone. Despite just exercise, most Fitbits monitor your sleep habits as well, a function that has a lot to do with your daily life as well as your exercise habits. If you can monitor your sleep, you can take steps to improve the quality of sleep you get, which helps your exercise life as well. Q: How Do Fitbits Work? 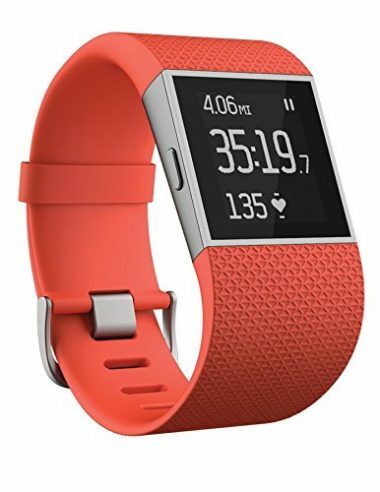 A: Fitbits have many different things in them that monitor different parts of your body, and they connect to an app on your phone that displays this information and lets you customize your Fitbit as well. Similar to an old school pedometer, Fitbits monitor your daily steps to see how far you’ve walked in a day. Each Fitbit does this slightly differently, some using GPS-like signals while others use a weight to see how much you move around. Most exercise smartwatches don’t count steps very accurately, but Fitbit has gotten this down to perfection. Fitbits also have a heart monitor that monitors your pulse through your wrist. By doing this, it shows you what your heart rate is while you’re exercising, a great way to make sure that you’re in your optimal heart rate range. By monitoring your heart rate, Fitbits can also monitor your sleep. Our pulses slow down when we sleep, and our pulses also fluctuate depending on the level of sleep we’ve reached. Using this information, Fitbits can show you your sleep patterns so that you can make any steps possible to improve them. Fitbits are wonderful tools that help us live our daily lives more efficiently than ever before. With that being said, waterproof Fitbits are even better and are great exercise accessories for any type of water sport, whether you’re just taking a dip in your own hot tub or going paddle boarding. Overall, the Ionic is the best Fitbit. 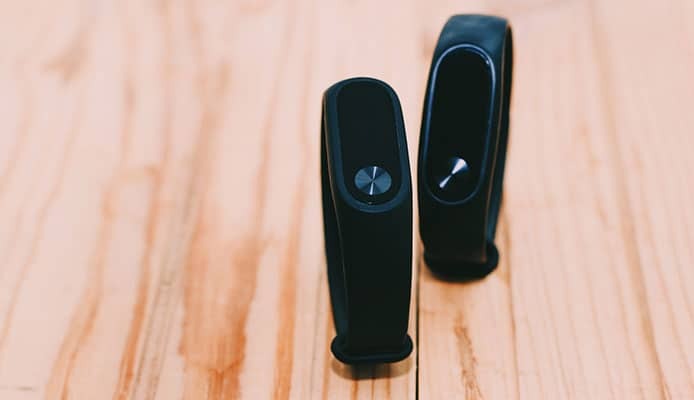 Despite the price being higher than each other Fitbit listed here, the Ionic combines the best features of each choice with the perfect waterproof capabilities that will have you protected against any mishaps. It’s also one of the highest rated Fitbits on this guide, so it’s been well received by consumers already. The Ionic has all the customization of other smartwatches on the market, as well as all the available apps. For a waterproof smartwatch, there’s not much more you can ask for. With the PurePulse heart tracking system, you’re also under the best care if you have any type of health issues. The band size isn’t too large or too small, leaving a sleek design that is great for all kinds of activities and won’t get in the way of any type of exercising either. The screen display is perfect, and it’s especially handy if you plan on taking any long trips. You’ll be able to keep your workout routine with you on the go, which is great for any kind of camping. With the phone sync up to 20 meters away, the Ionic takes the cake when compared to other smartwatches and even other Fitbits. This gives you the freedom to explore your surroundings (or visit a bathroom) without having to trek your phone along. The battery life is the only downside to the Fitbit Ionic, but 4 days is still longer than most other smartwatches. 4 days is plenty long enough for a secluded trip, and if your trips are typically longer than you probably have a way to portably charge things like your phone anyway. If you’re looking to save money and aren’t interested in the flashy style and features that the Ionic has to offer, then the Flex 2 may be right up your alley. Both of these Fitbits are excellent for water activities, and the only difference between the two (besides price) is just personal preference. Where the Ionic has almost every feature seen in smartwatches today, the Flex 2 is almost the opposite and just provides you with a simple way to track your water exercise. 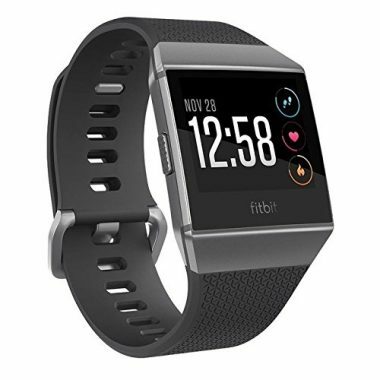 Overall, the Fitbit Ionic is the perfect blend of everyday smartwatch and a Fitbit made for swimming, so you won’t have to worry about any water with this water resistant Fitbit. If your wallet can afford it, check into getting your Ionic today!